A Saturday which, forecast wise, hadn’t promised much, suddenly brightened around lunchtime. Over our bowls of soup, I quizzed the family about their plans for the rest of the day, but for one reason or another they were all indisposed. 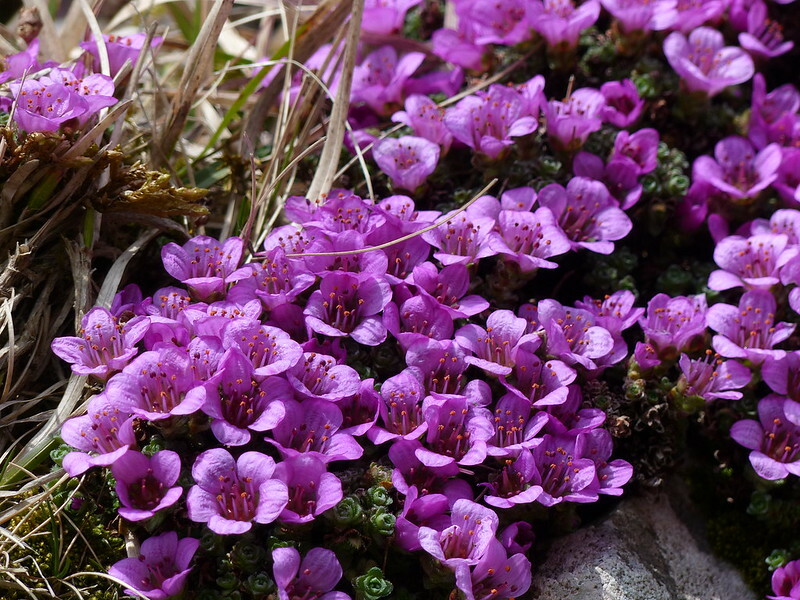 I wanted to make the most of what was turning into a glorious afternoon, and it didn’t take me long to decide what to do: another hunt for Purple Saxifrage, having been a little too early for it on Ingleborough just over a week before. I hadn’t actually made my mind up whether to tackle the walk on the western slopes of Ingleborough, which had been the original plan for my previous outing, or to head back to Pen-y-ghent where I first saw the saxifrage last year, but as I drove north from Ingleton I noticed that the Hill Inn was doing a roaring trade, likewise the Station Inn at Ribblehead. 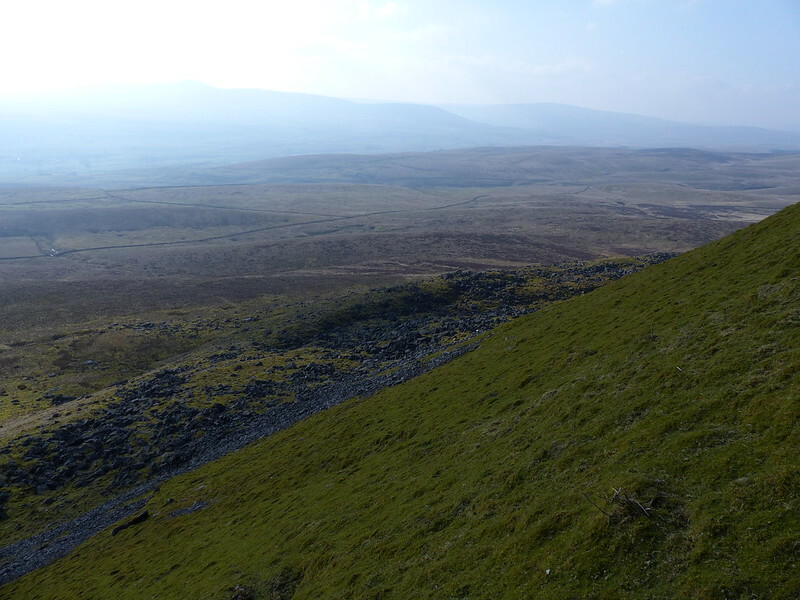 More importantly, there was a distinct lack of parking spaces and some of the roadside parking was decidedly dodgy, so I opted for Horton and Pen-y-ghent. 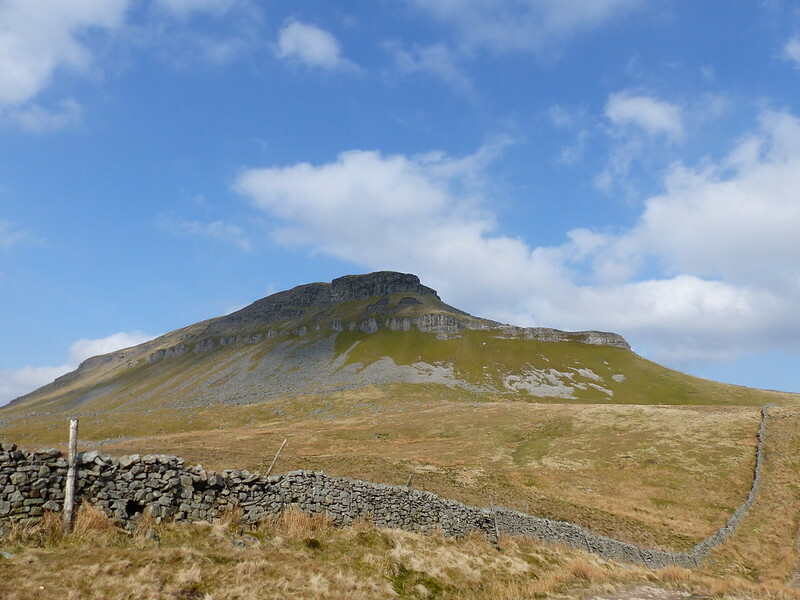 As I drove down Ribblesdale towards Horton, I passed scores of walkers coming the other way up the road. Presumably, many of them were ‘doing’ the Three Peaks. They’d picked a fine day for it, but to these eyes at least, a lot of them looked hot and knackered and not particularly happy. 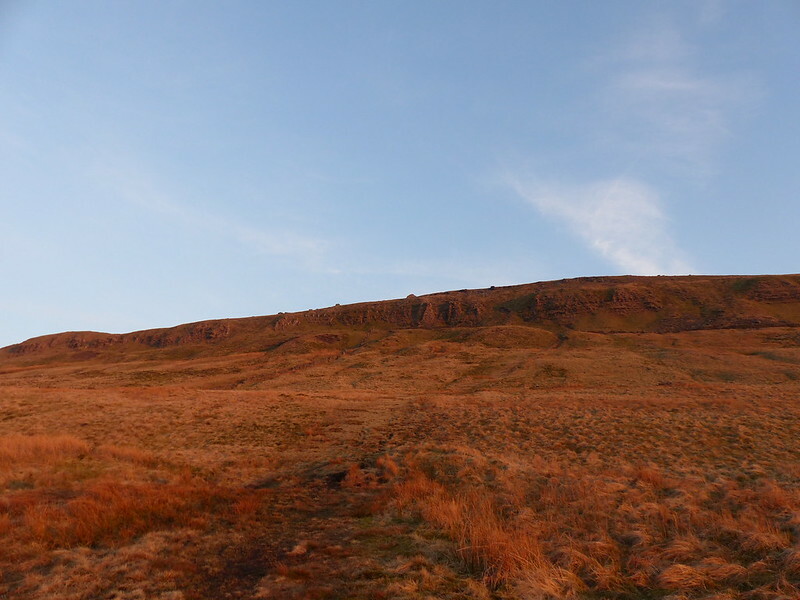 Anyway, Horton was relatively quiet and I was soon climbing the nice steady Brackenbottom path, stopping regularly to take photos of the changing views of Pen-y-ghent. There were still quite a few people about; mostly, but not exclusively, on their way down. 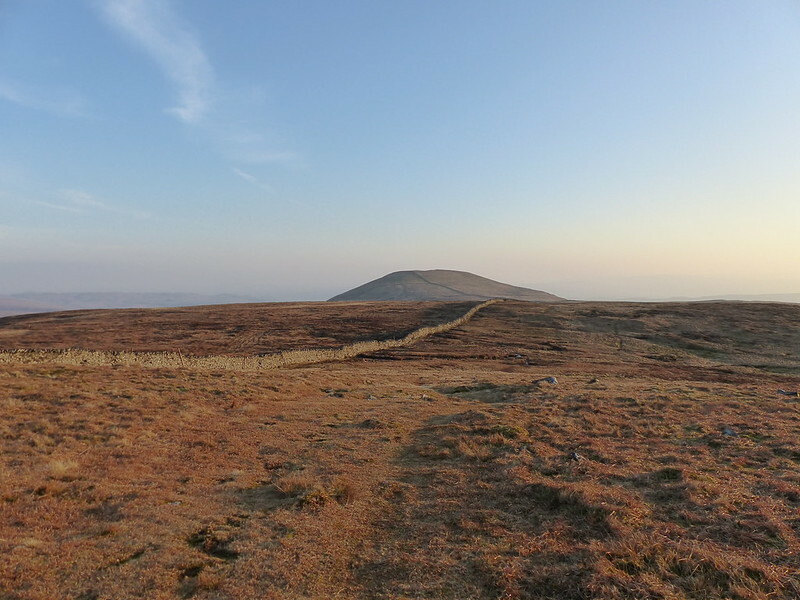 I was quite surprised that there seemed to be a few parties following me up the hill, given that I’d only set-off from my car at around 3.30pm and most walkers seem to be fairly rigid about the times which are suitable for beginning and ending a trip. …a couple stopped to ask me if I was “walking or sight-seeing?” They also wanted to know about the zoom on my camera. Although, in retrospect, it’s actually more true to say that, of its kind, it has a relatively modest zoom. I thought I might be able to demonstrate. 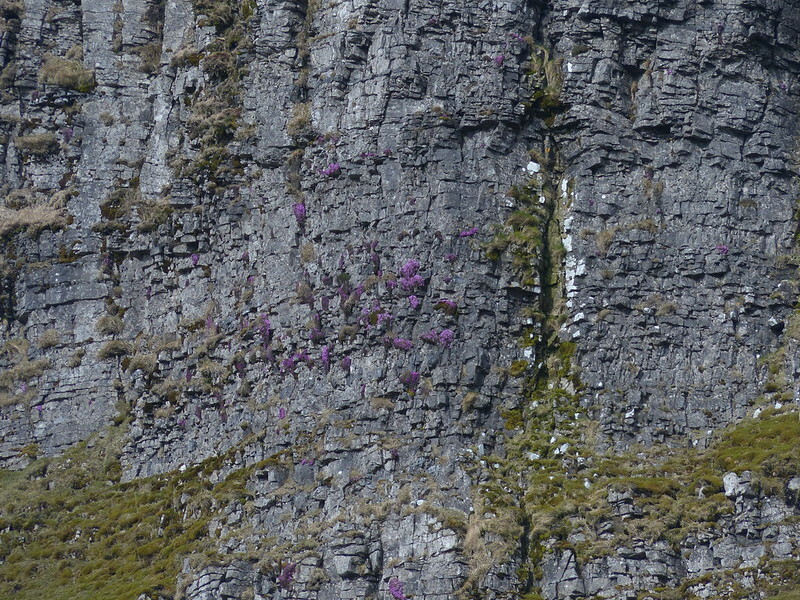 This not only impressed the punters, but also settled my immediate plans: I would stick to the path as far as the lower line of cliffs and would then traverse across beneath those cliffs in search of saxifrage to photograph. After that? 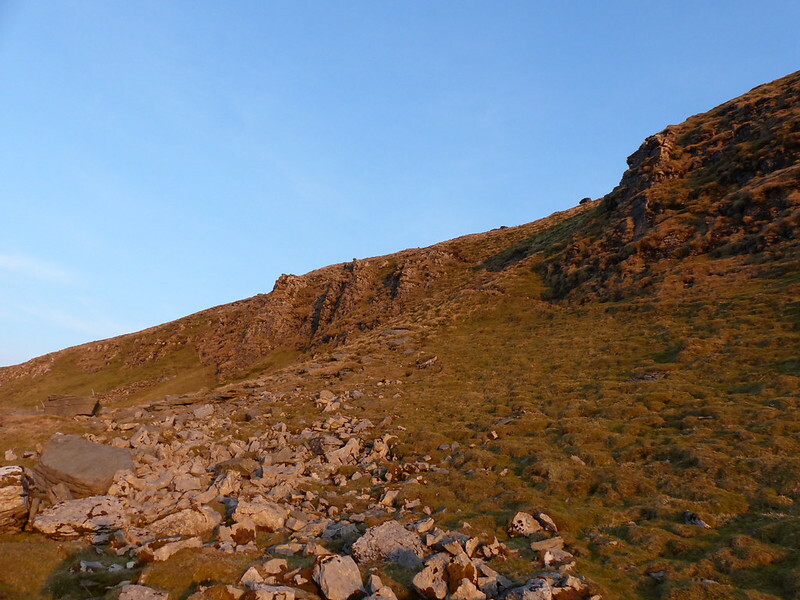 Well, time would tell: maybe I could continue below the cliffs as far as the next path up to the summit; or perhaps I would retrace my steps; or maybe, seeing how broken those cliffs are, I could work out a route up through them to the top. I think the sheerness of the rocks was magnifying, in my mind, the gradient of the mossy ground beneath. 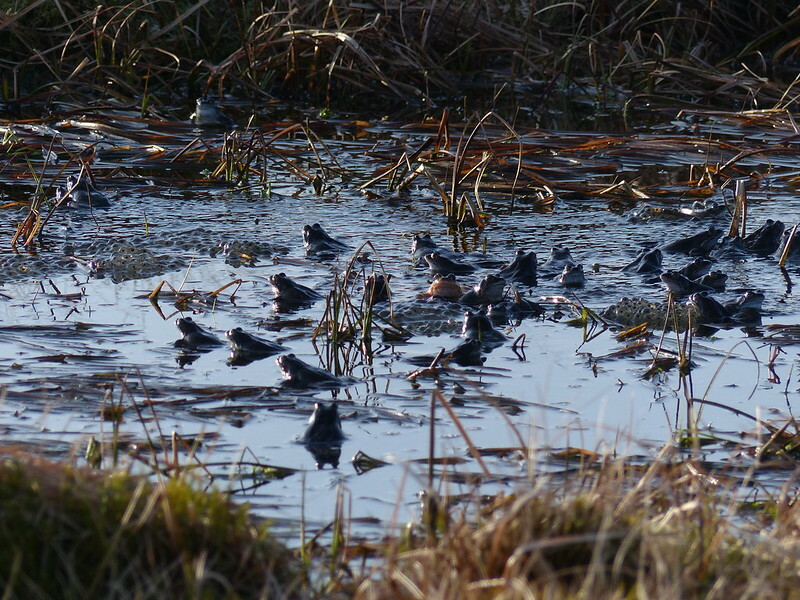 At least the treasure I’d come seeking was there, in some abundance…. I was just pondering on what might be pollinating these early flowers at this altitude when a Bumblebee buzzed over my shoulder in search of nectar. I suppose coincidences like this, when the workings of the old grey matter and events in the outside world somehow conspire to run in tandem, only seem eerily common because whenever they happen it’s striking and we remember it. 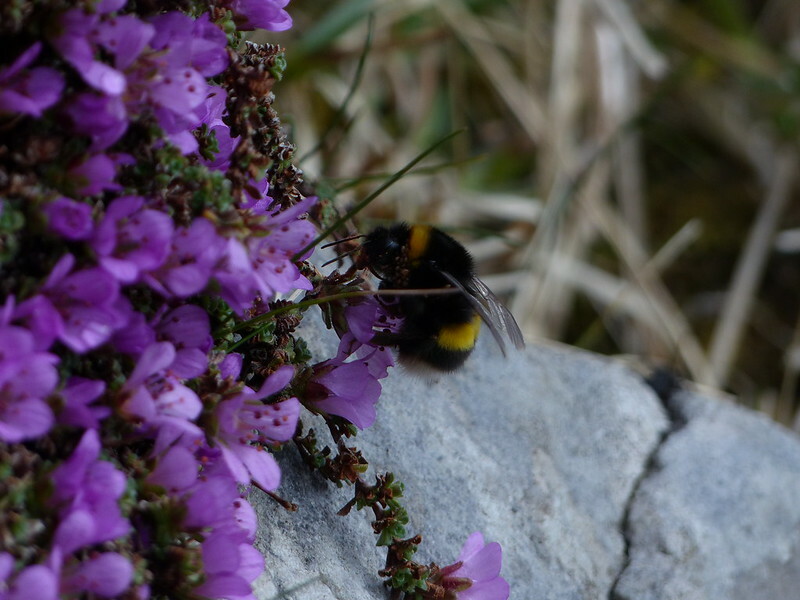 This bee might be a Buff-tailed Bumblebee, or a White-tailed Bumblebee, or a Northern White-tailed Bumblebee, workers of which species, I’ve just discouragingly read, are ‘virtually indistinguishable in the field’. Or maybe it’s none of the above. 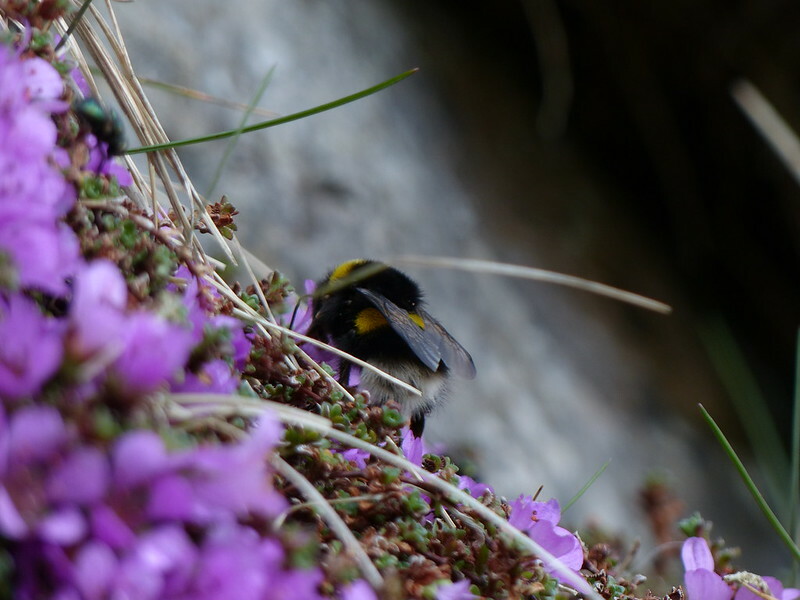 Bumblebee identification is very tricky. 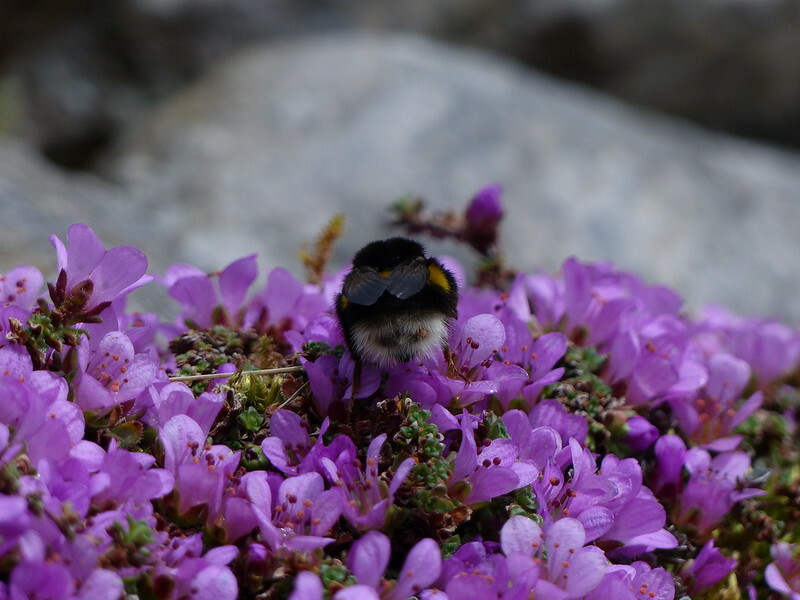 Whilst I took these pictures, a second bee, some kind of Red-tailed variety, began to forage from the same clump of flowers, but proved too elusive for me and my camera. 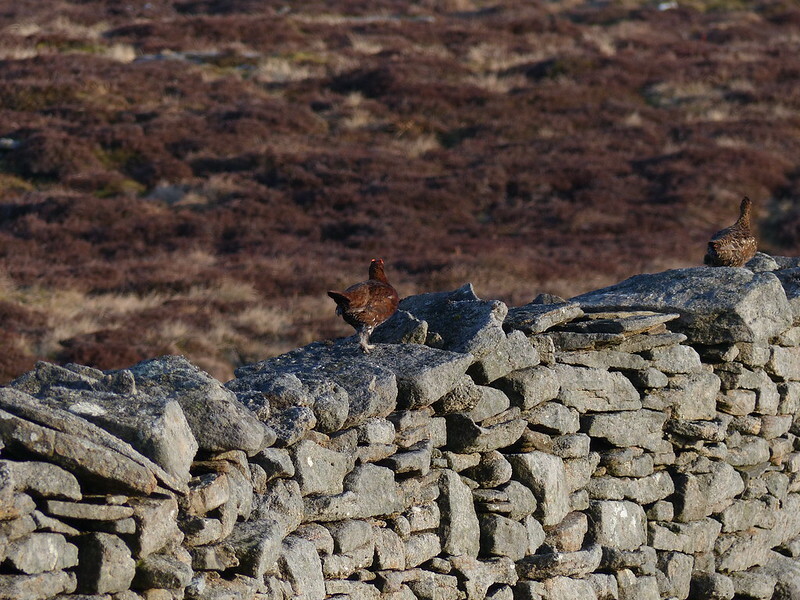 …although they are hard to see, several more clinging to her neck. I wondered whether they might be mites, so did a little lazy internet research. Apparently Bumblebees do sometimes host mites, but, somewhat to my surprise, the mites are thought to be generally benign. They live in the bees nests, subsisting on honey and wax and then, at certain times of the year, piggyback a lift to flowers in order to jump a ride on another bee and find a new nest. Free-loaders! However, whether these are mites or not I’m still none-the-wiser. 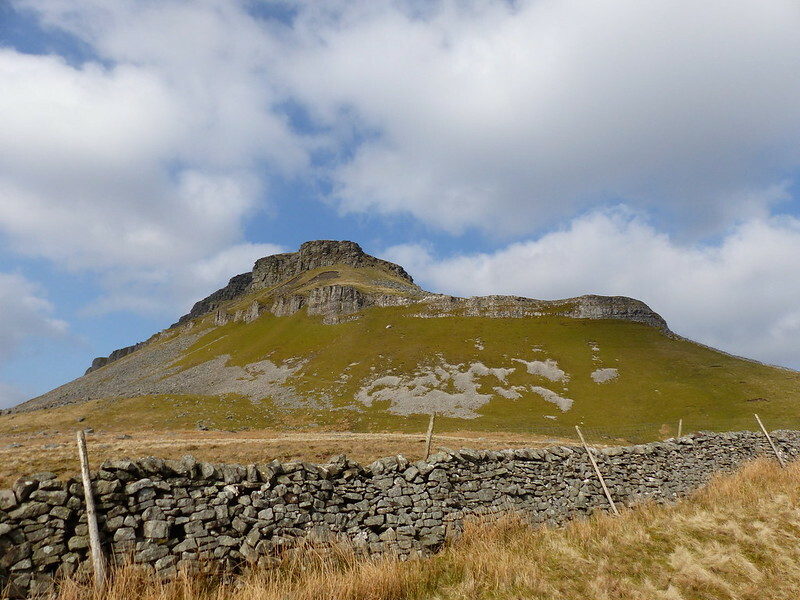 …it seemed that Pen-y-ghent, like Ingleborough, has had a substantial landslip, something I shall have to come back to investigate another time. 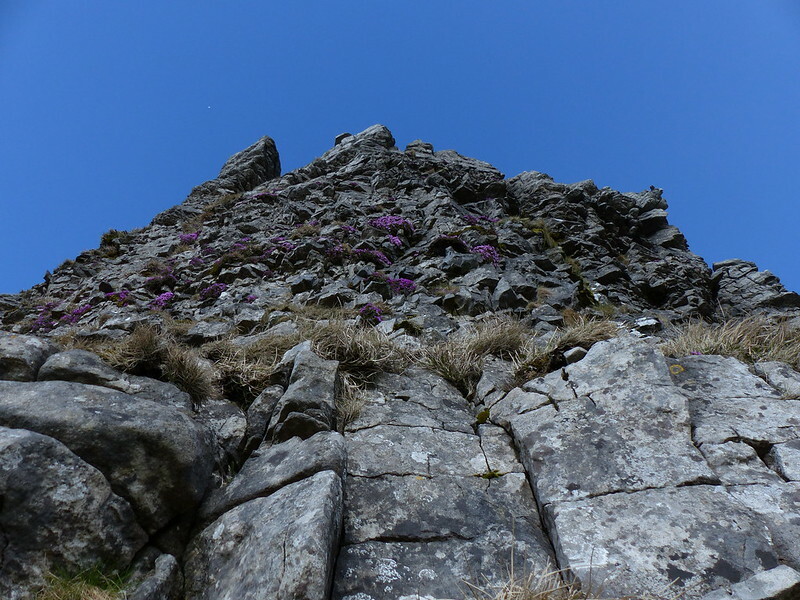 At first, I thought that this feature, on the left of the cliff, might be a tower, but in fact it’s a large fissure, what climber’s would call a chimney, I believe. Just beyond here the cliffs, which had always been rather intermittent, gave out altogether, at least for a while. 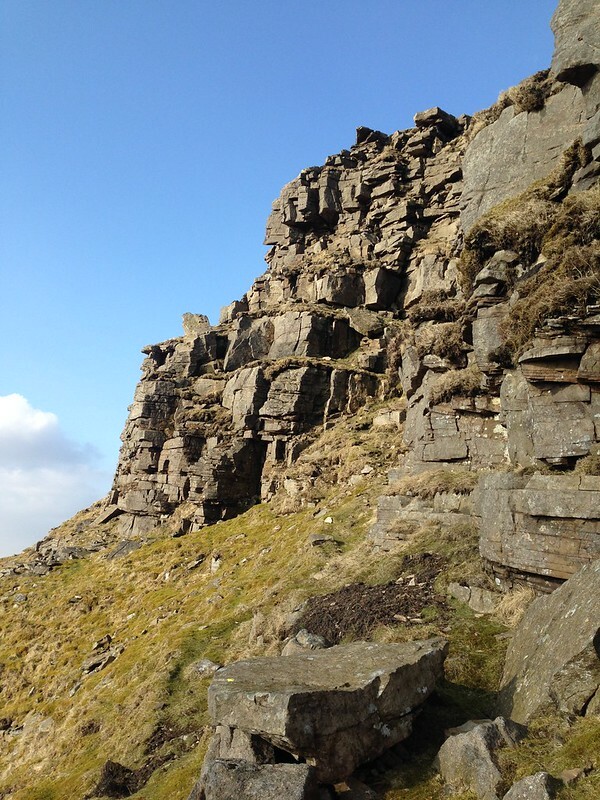 Above I could see more steep slopes and then the second line of crags, presumably of gritstone. 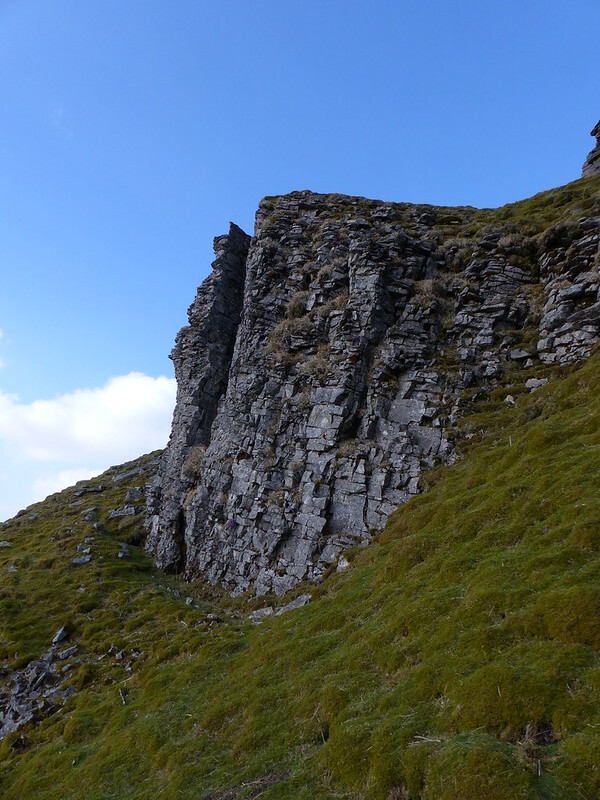 These were taller crags and fairly imposing, but on the left you can see the edge of a wide gully which looked like it might be a chink in the mountain’s armour. 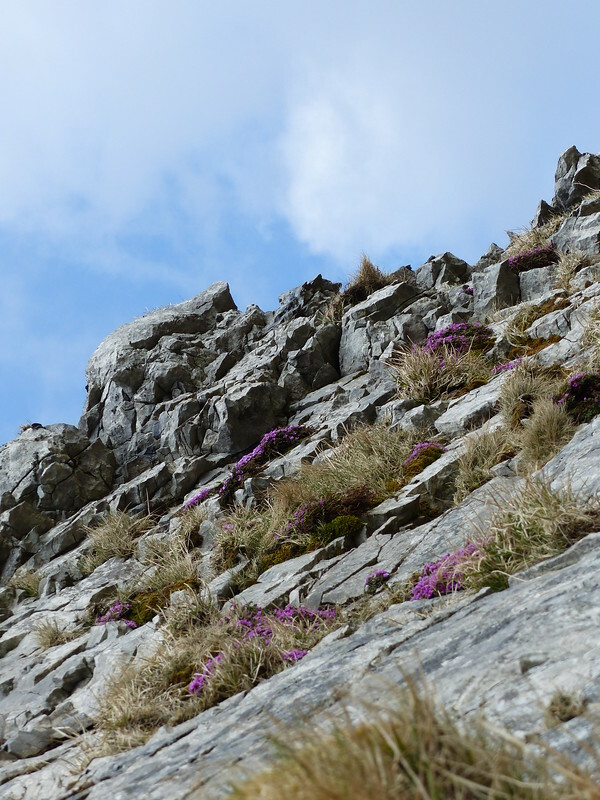 I probably could have got up the gully, it was neither particularly steep or very exposed, but the first little scramble required a large step-up which, not as agile as even the clumsy, inept scrambler I once was, I decided not to attempt. 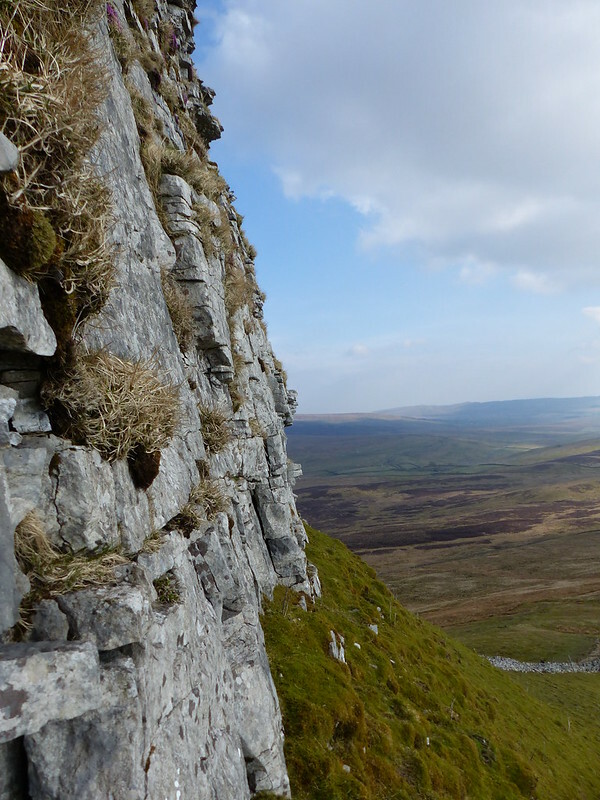 Instead I contoured out on the ledge roughly half-way up the crag opposite. 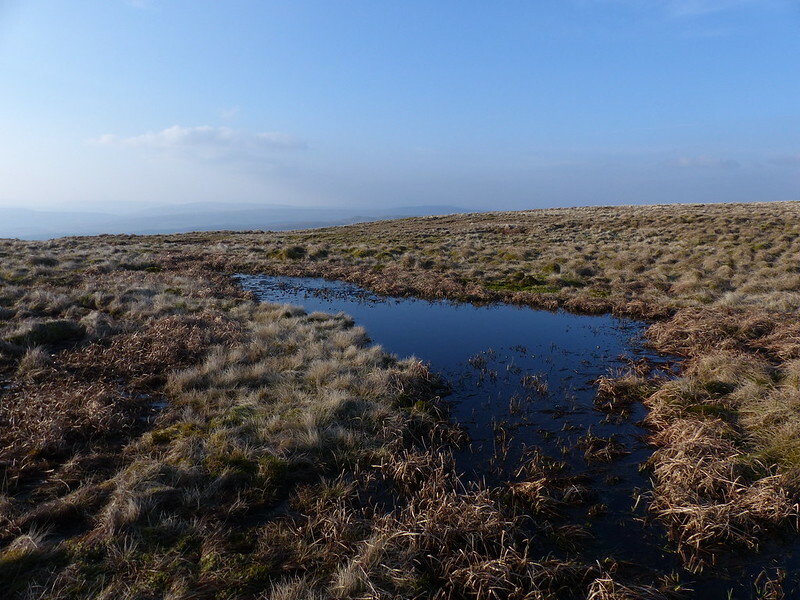 And turning the corner, found that I’d also turned the crags and was faced only with a short walk, admittedly up a steepish and unpleasantly loose slope, to the summit plateau. …and a clever S-shaped bend makes two shelters one facing east and one west. 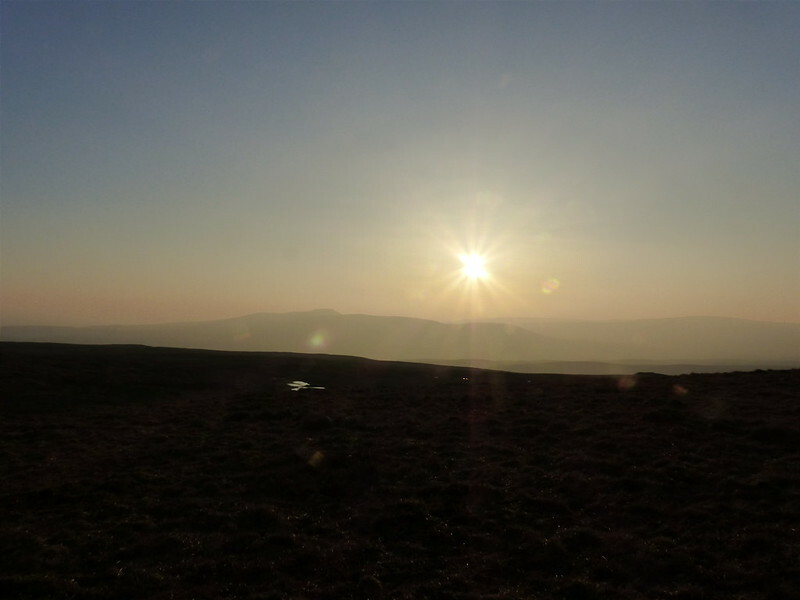 I sat in the west facing one, with the sun and a hazy Ingleborough in view. 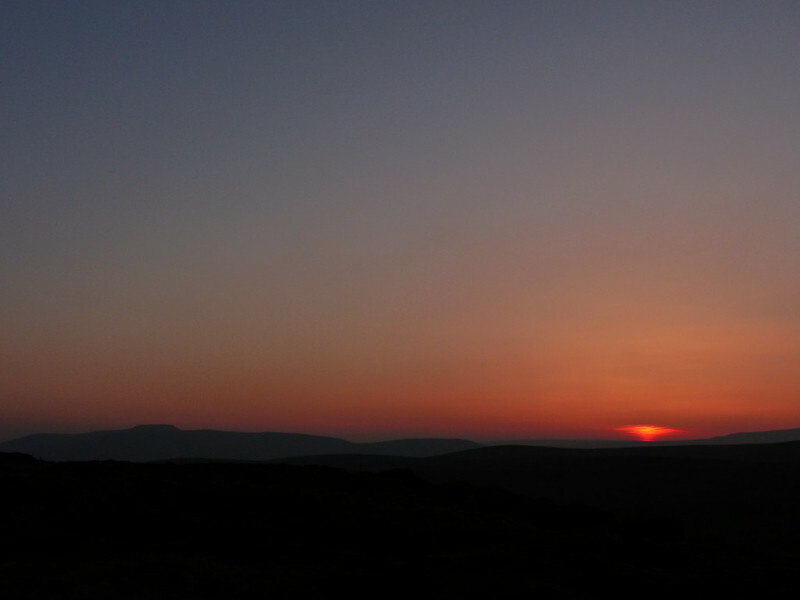 It was around 6.30 in the evening. I put a brew on and sat back to enjoy the fact that, after all the crowds I had seen earlier, I now had the top entirely to myself. It can be done, even on this most popular of hills. As I was finishing my brew, I heard a runner coming up the path behind me. He’d been surprised by the heat and was gasping for a drink. Fortunately, I had two bottles of water with me – far more than I was ever going to need, so I was able to help out. 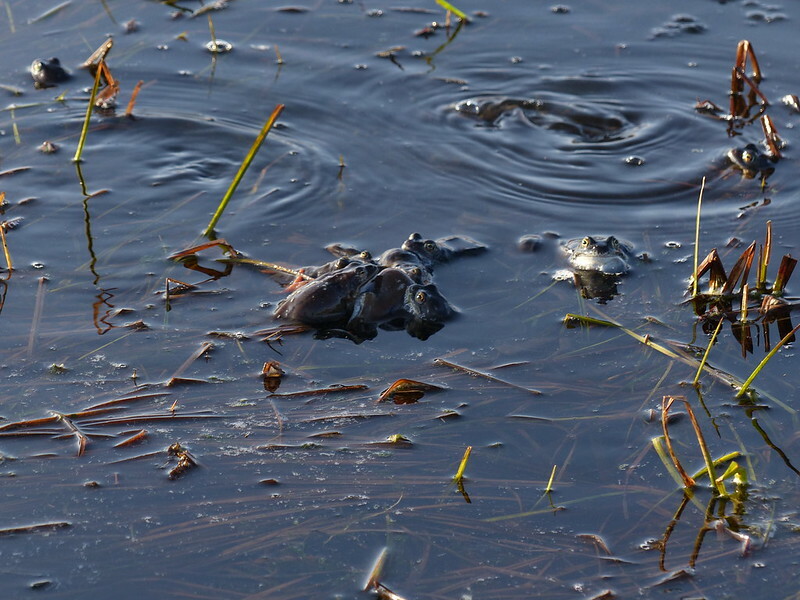 My presence caused many of the Frogs to submerge and disappear, but some were not so easily discouraged and I watched, listened and took photos for around twenty minutes. I’ve seen this before, once in Wark Forest back in 1985 when my Dad and I were close to finishing the Pennine Way, and the other time at Lanty’s Tarn when we were staying in Patterdale YHA for a big family Easter get-together, which must be of a similar vintage. 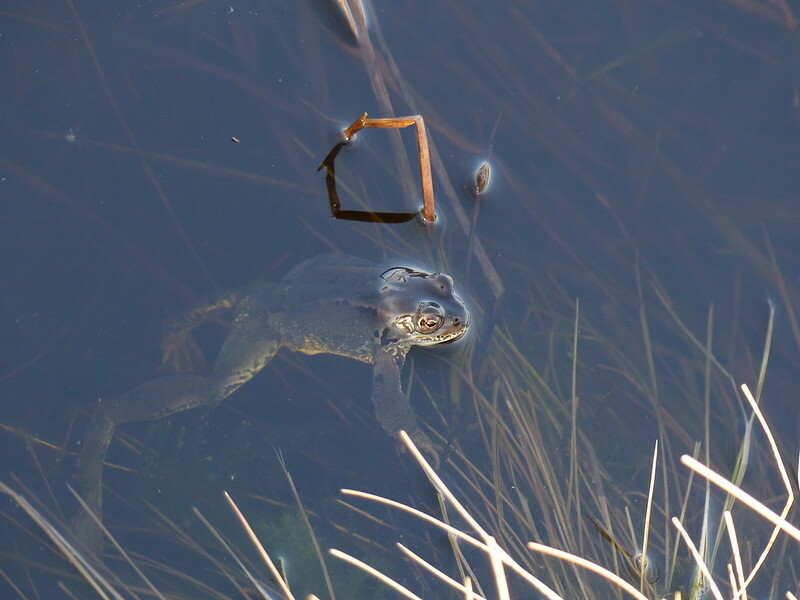 I did think I’d seen Frogs mating much nearer home at Leighton Moss a few years ago, and then again a year later, but now I’m completely convinced that those were in fact Toads. 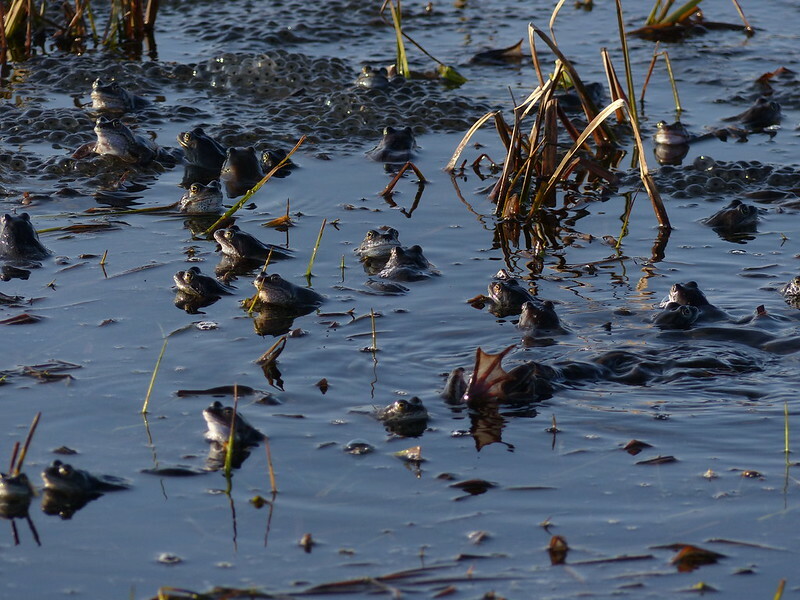 What the photos can’t capture is the singing and the frenetic activity, with balls of frogs rolling and surging and other frogs pushing and jumping to join in. I think the Frog on the right here has his throat bulging pre-song like a tiny Pavarotti. 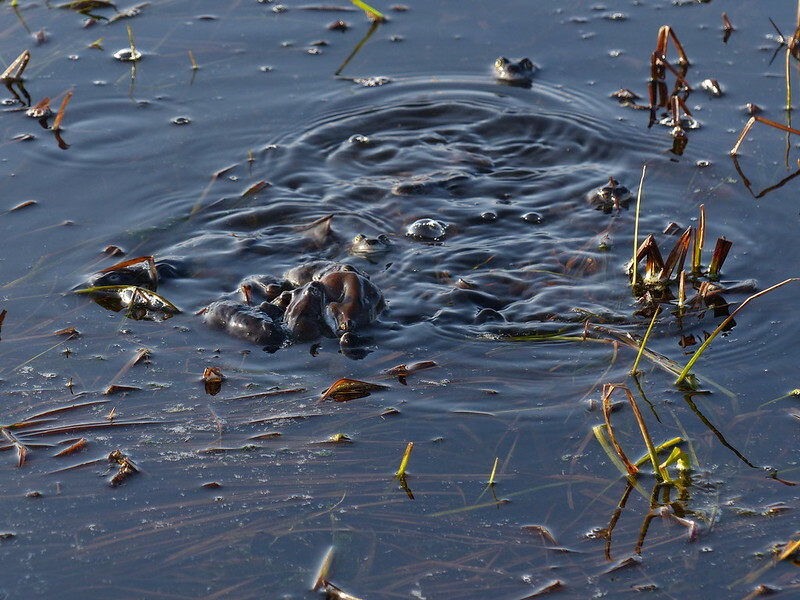 Perhaps this photo, with the boiling surface of the pond and the indistinguishable welter of Frog flesh does go some way to capture their energetic couplings. Hmmm…perhaps ‘couplings’ is the wrong word? 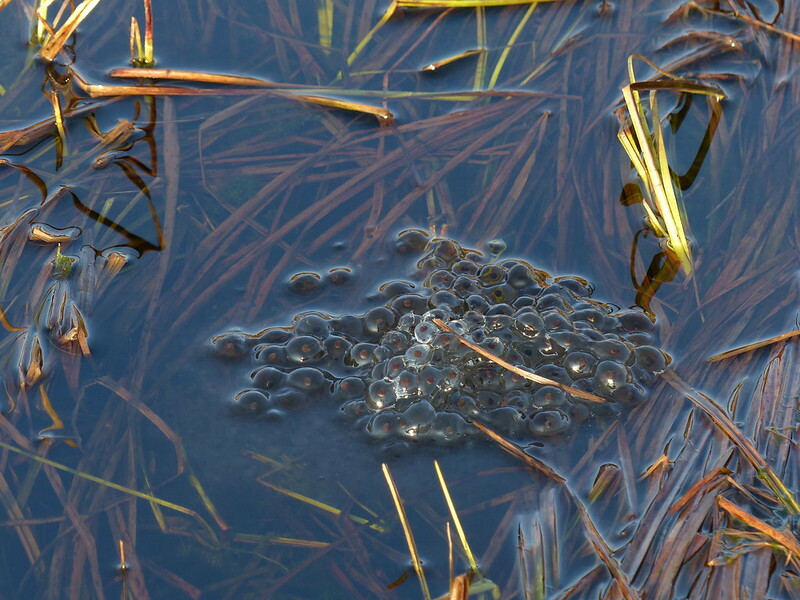 Some of the Frogs, meanwhile, held themselves aloof. 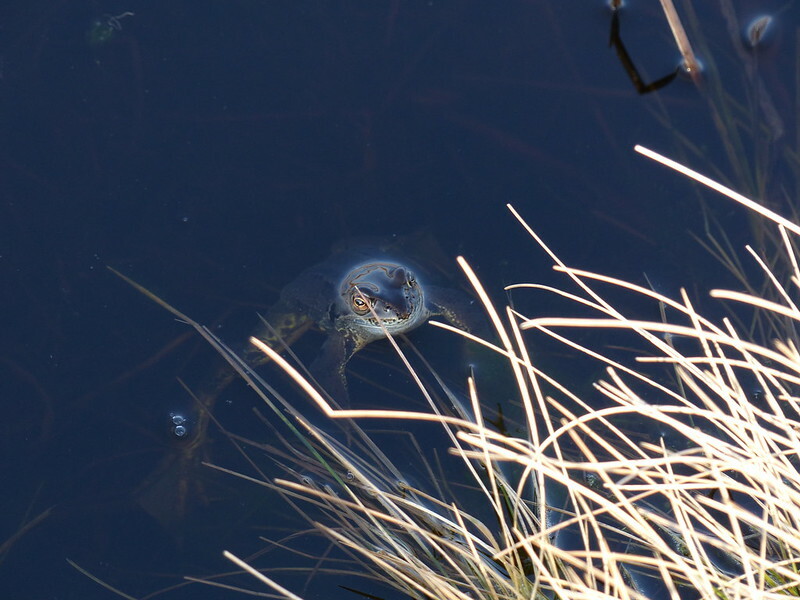 This one seemed to be keeping a beady eye on me. Eventually, I dragged myself away. 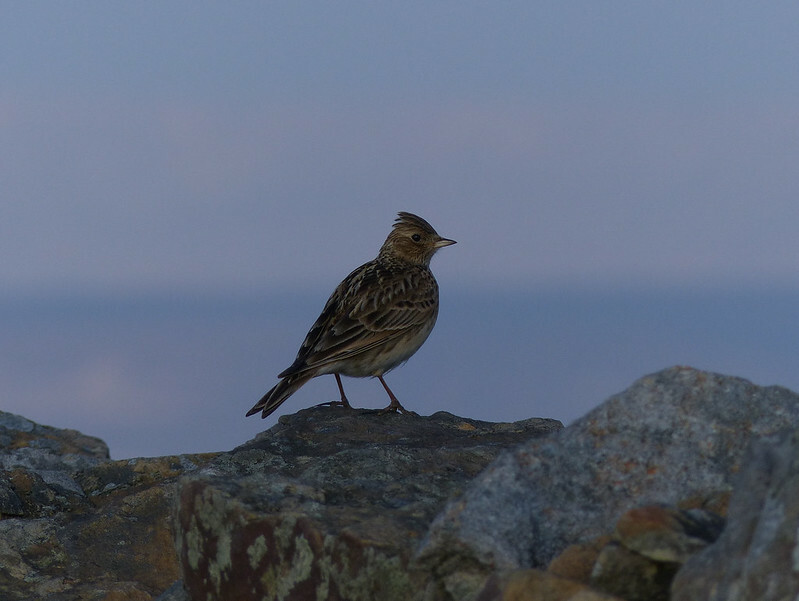 Daylight was short, I knew, and the extension over Plover Hill would add a few miles to my walk, but the light was glorious and it seemed churlish not to continue. I think that the male, at least, has similar ideas to the Frogs. I suspect I’ve probably been up Plover Hill before, but if I have, I’ve forgotten. 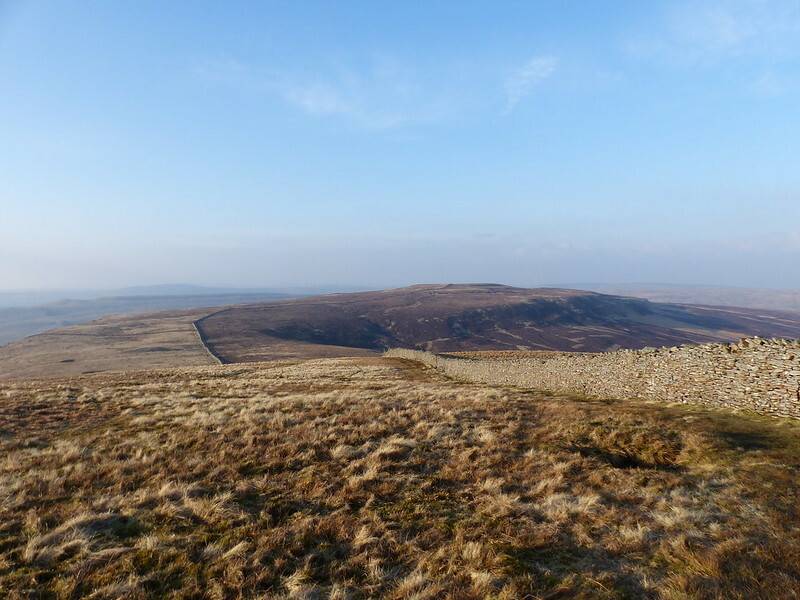 The descent towards Foxup Moor has one short steep section, but a cleverly constructed section of path cuts down across the slope at an angle, taking the sting out of it. Looking back up to Plover Hill. 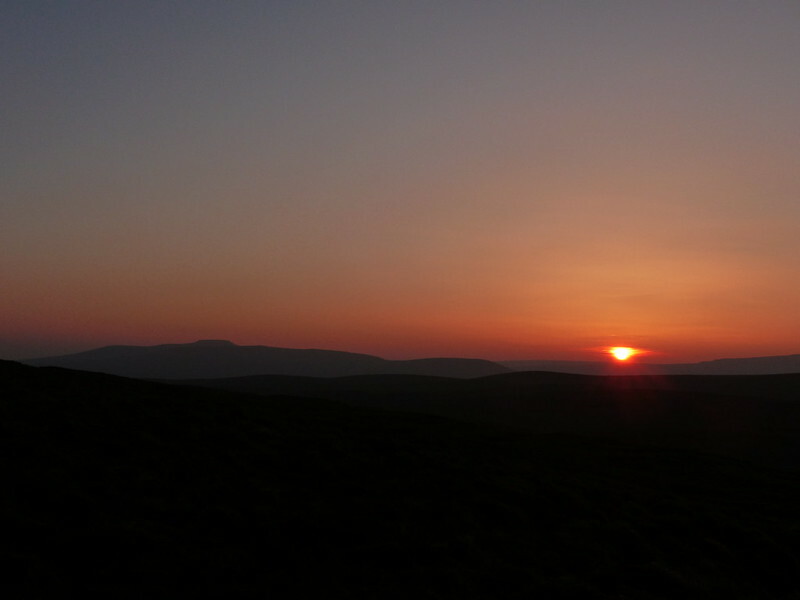 With both me and the sun losing height, I knew that sunset must be imminent. I kept walking 50 yards or so and then taking another photo. 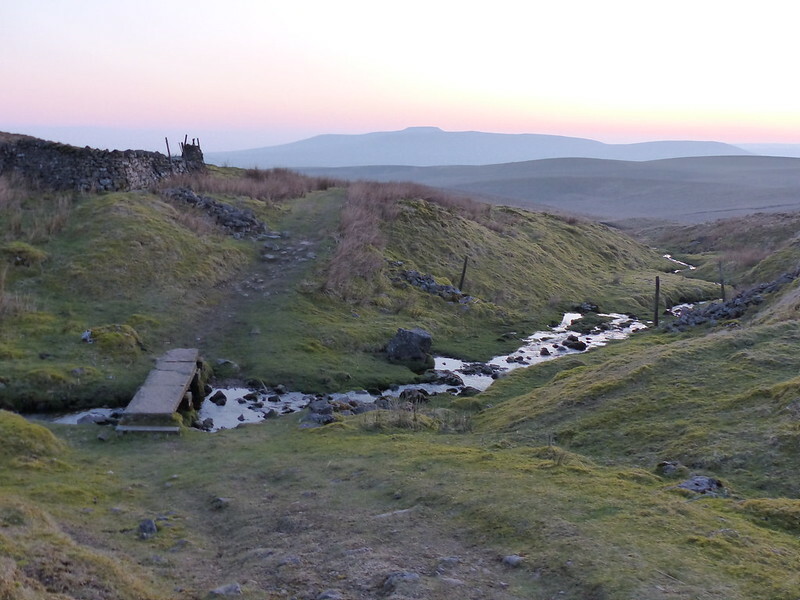 Ingleborough on the left. 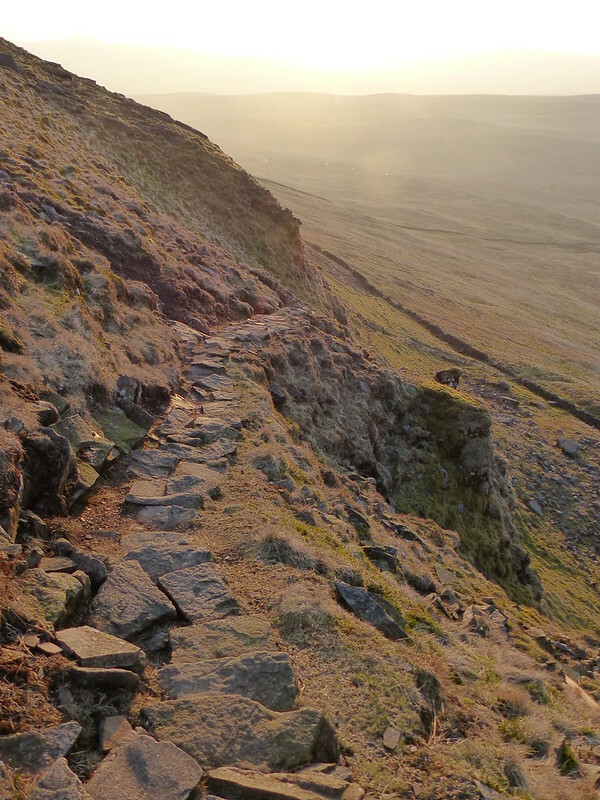 Whernside on the right? 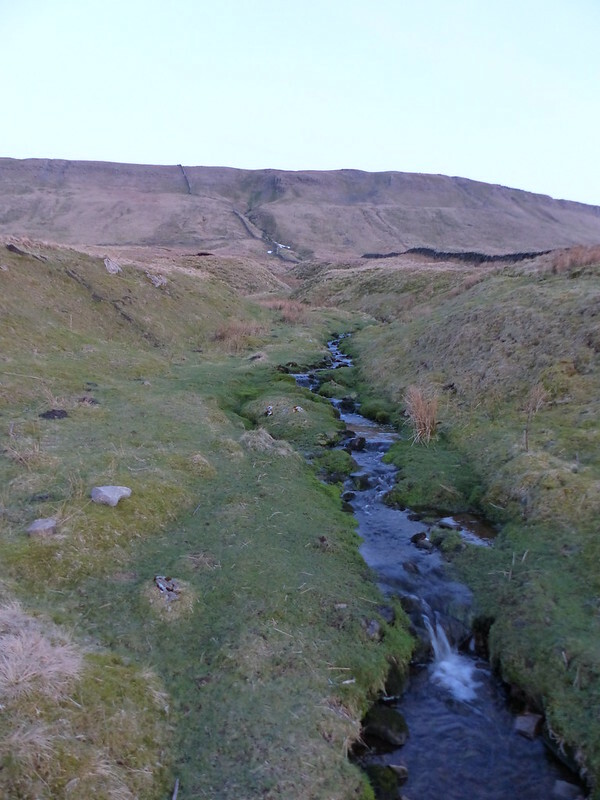 …which looked to have waterfalls upstream and would make for an interesting route on to Plover Hill for another day. At this point I stopped taking pictures and concentrated on getting as far down the hill as I could while the light remained. Sadly, the path eventually became fairly boggy, which was a bit awkward in the poor light. When I reached the end of the walled lane down into Horton, I realised that I couldn’t read the fingerpost and so finally switched on my headtorch. But I knew the walk from there would be relatively easy anyway. My final mile or so, in the gathering gloom, was enlivened by the lyrical calls of Pee-wits and a cacophony of squabbling Jackdaws settling down to roost in a nearby wood. Just over 10 miles and 500m of ascent. Not bad for a spur of the moment thing. Not that it’s the stats I will remember! Bumble bees – blogger’s gifts, and many other blogger’s gifts besides – fascinating. 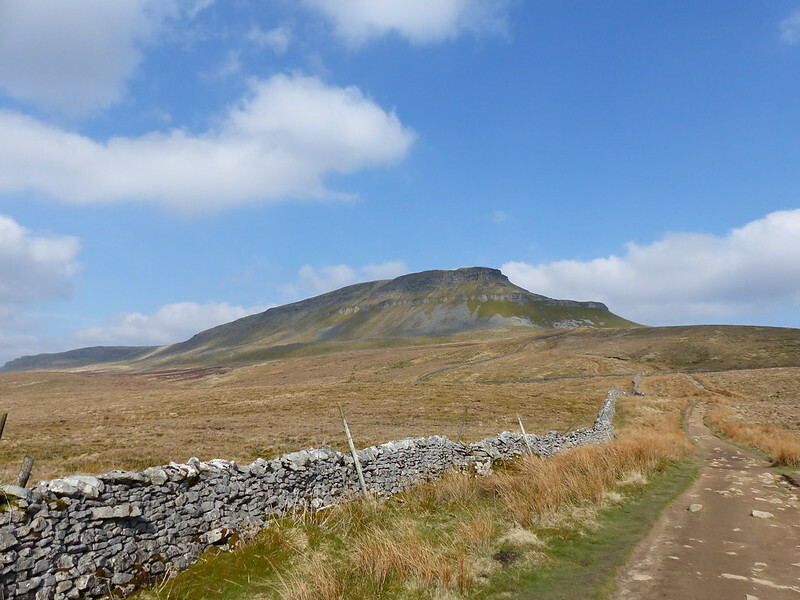 There are proper climbs on Pen-y-Ghent which were originally developed by Alan Austin, and others. Alan was one of the most prominent climbers in the 60s who I knew as a member of The Yorkshire Mountaineering Club with which I was loosely associated. One climb name stuck in my memory up there – I think it became a classic, although not desperately hard it was called Red Pencil; I know not of the derivation. 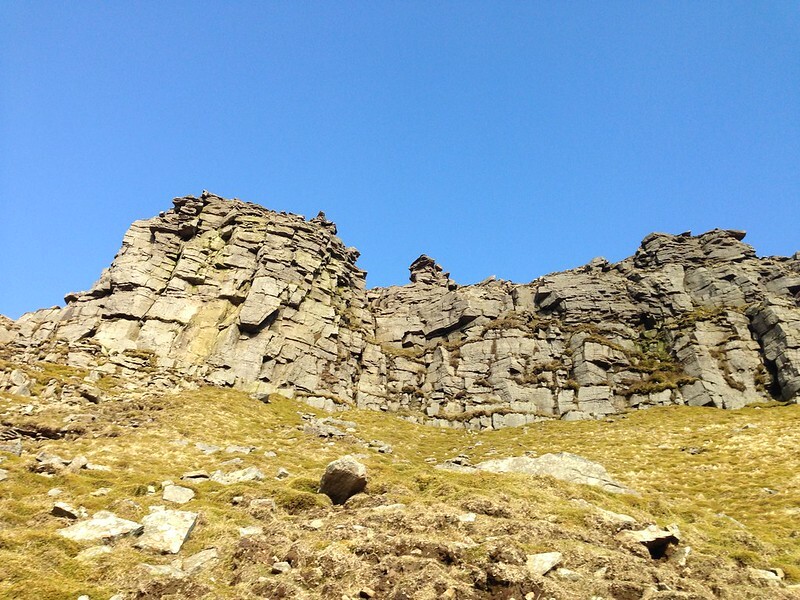 You were wise to shun the steep crags. It all seemed very loose and unreliable to climb on. I feel like I’ve heard about Red Pencil before – I wonder where? Great set of photos. Never fancied doing the three peaks much as each hill looks good enough to enjoy on its own rather than race across them. Anytime I have done more than one large hill I didn’t enjoy the others as much as the first.one. Also, going slower you see far more as your photos prove. 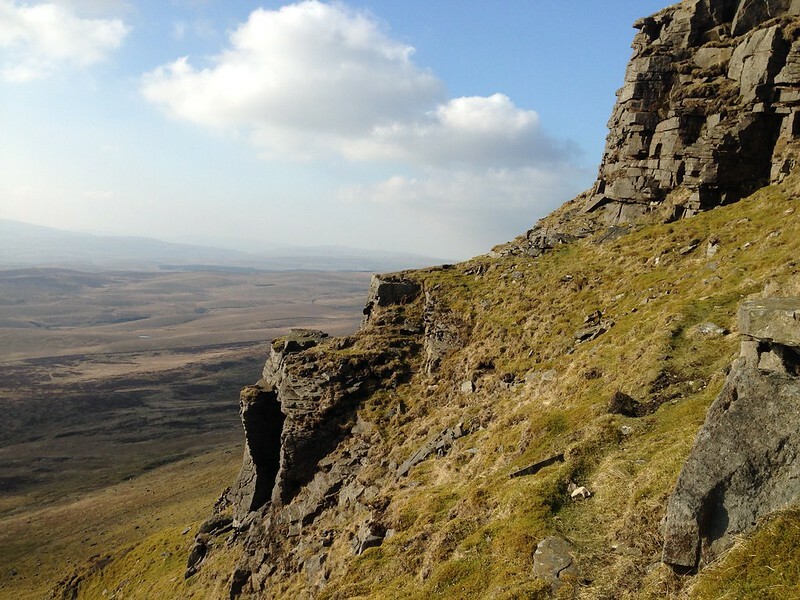 I’ve done the Three Peaks a few times in my youth, and a fair few other ‘challenge’ walks – the Welsh Threes and the like. 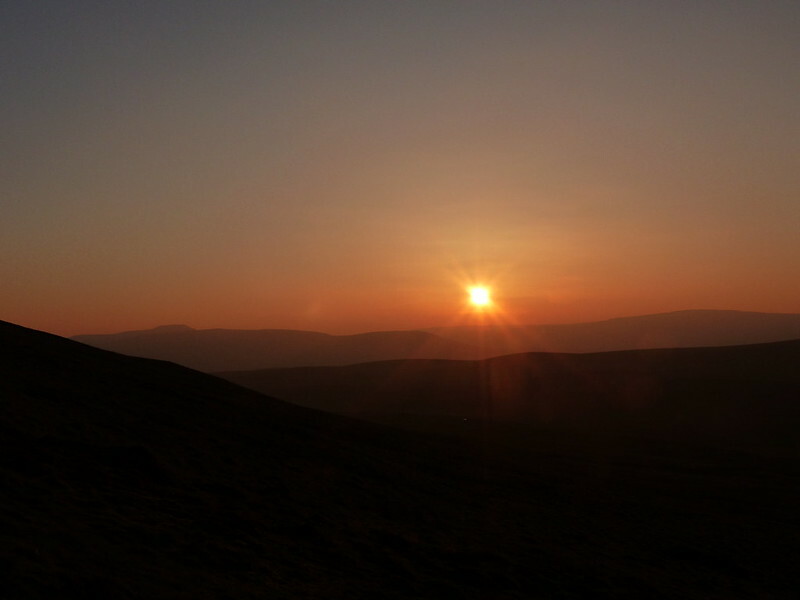 I think the ‘Big Walks’ books are to blame perhaps – I used to tag along with my Dad and his friends. I can see the attraction, but these days I’m with you – I like to take my time and see more. That’s the whole point of walking surely? Well, it is for me. Thanks for a beautiful set of pictures. I’ve a lot to learn! 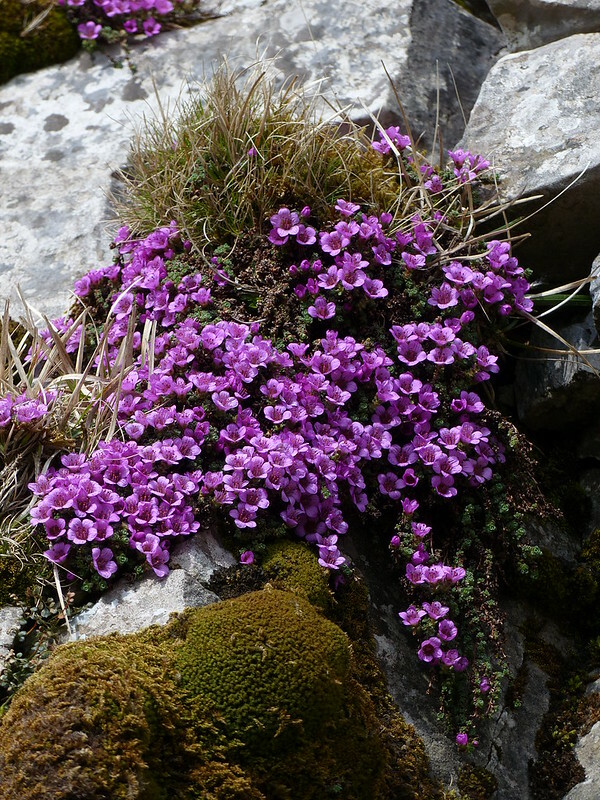 It must be 50 years since I saw the purple saxifrage though I’ve been on Penyghent many times since either racing or walking. 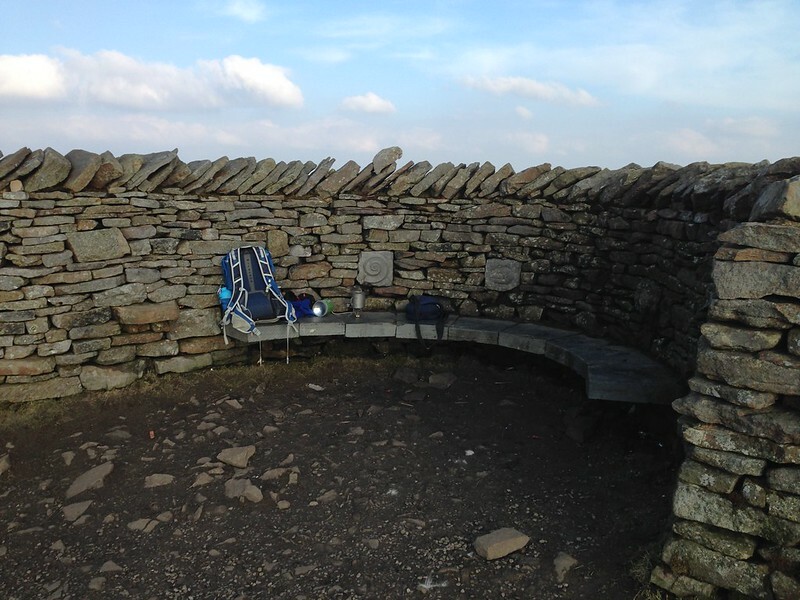 Even now, in my 80’s, I’m usually up Penyghent on race day to cheer them over the summit. 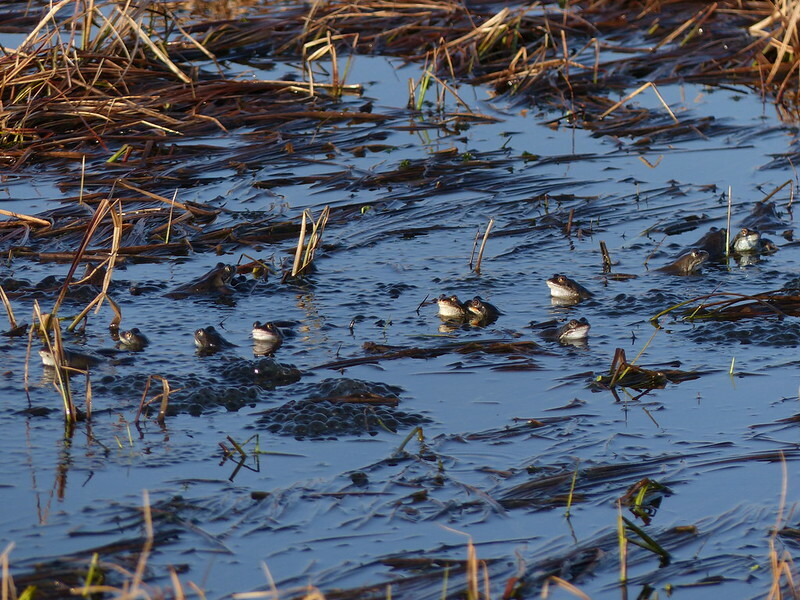 I’ve been over Plover Hill too but never seen the frogs. I have now – in your sharp, wonderful pictures. Was the race this weekend just gone? We drove past that way on Friday evening and I noticed some signs we made me think it might be. Yes, the Peaks race is always the last Saturday in April. It’s quite a spectacle if ever you get chance to go. Sigh. Just so lovely. Your words and photographs. Thank you for this, so peaceful! Everything about this is stunning. Thank you for posting. 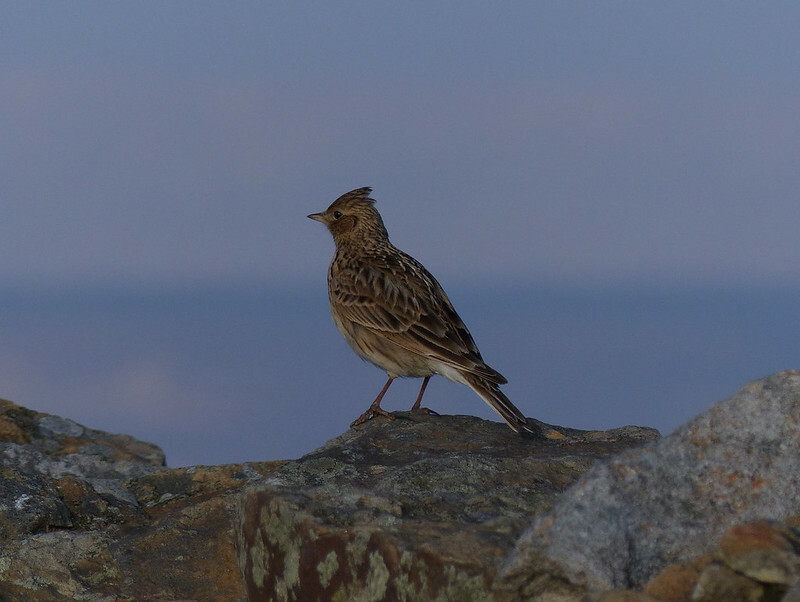 Just a brilliant read – flowers, birds, frogs and sunset! Thanks Helen. Sometimes a day comes along when there’s something to see, and photograph, seemingly around every corner. This was a corker! It was a bit of a cracker. I did traverse across a steep slope, but there wasn’t a path. An occasional bout of off-piste is definitely the way to go. Lovely photos! Do you ever use your camera to shoot video, or are you all about the stills photography? 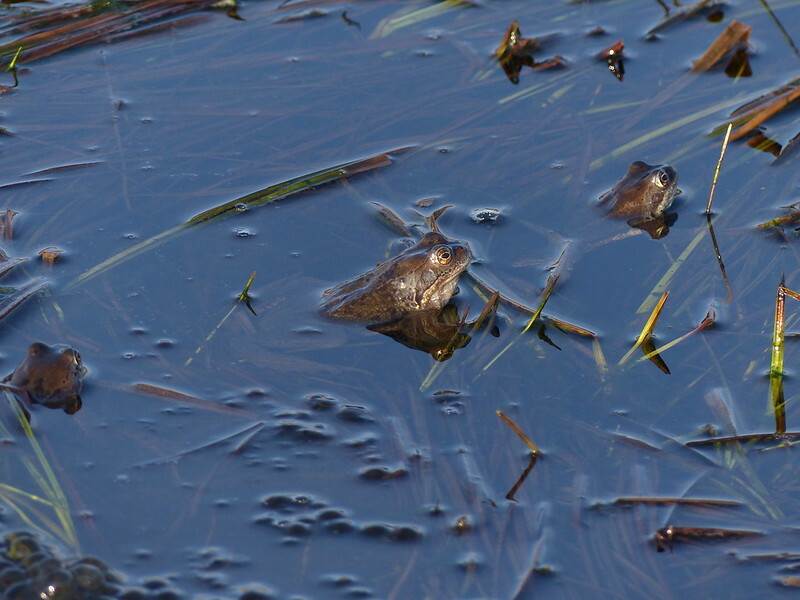 I videoed the frogs – trying to get the sound, which I did to a certain extent. Video is a bit of a frustration to me; I don’t think I can directly load video to WordPress, because I have a free account, I’ve tried uploading them to flickr and then linking to wordpress, which is what I do with photos, but that doesn’t seem to work, and when I upload videos to Youtube and link them that way all quality seems to be lost giving an end result which isn’t worth sharing.